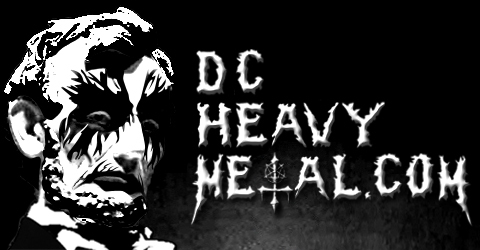 Well it is Black Friday and starting today, November 23rd 2012 through Sunday December 2nd I’m going to be doing a presale for DCHeavyMetal.com t-shirts. I’ve had a lot of people ask me about them lately so I’m going to print up another batch. 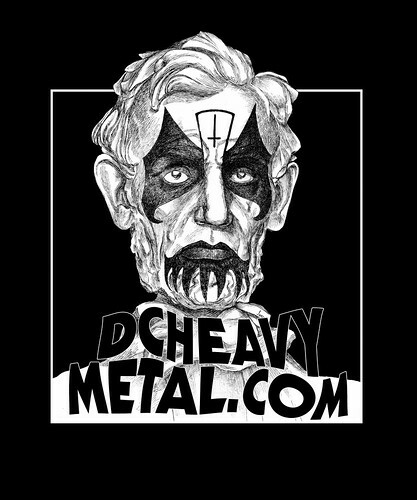 The artwork will be the black and white version of Abe Lincoln in the King Diamond style corpse paint printed on the front a black Gildan tshirt. The artwork, shown below, was drawn by Joshy Brettell (drummer of the local metal band Ilsa) and you can see some more of his awesome artwork here. The shirts are being printed by MiNDJACKET Designs, check them out here and here if you need some shirts made or just like funny shirts. They will be selling various other shirts at the Spellbound Freak Bazaar on Sat the 24th from 5pm to 9pm. Details on that event are posted here. Add $1.50 per shirt if you are paying via Paypal using a credit/debit card (you do not have to pay the extra $1.50 if you paying with Paypal directly from a bank account). Add $1 if you need size XXL. If you need a size larger than XXL please email me at DCHeavyMetal@Gmail.com before you order so I can figure out what the price will be and if I can even do it in time for Xmas. Be sure to include a note in the Message section with whatever address you want the item shipped to and what size you want. If for some reason you don’t send the note properly, just email me from the same email address you made your payment from with the size and shipping info. If you don’t send me the right amount I’m just going to refund your purchase and you’ll have to try again. I am trying to make this as cheap as possible for everyone. If you don’t want to use Paypal you can just give me cash at an upcoming metal show. During the time this promotion is running you’ll be able to find me at High On Fire at the Rock & Roll Hotel Nov 23rd (details here) and Biipiigwan at Casa Fiesta on Nov 30th (details here) and Cannibal Corpse at the Rock & Roll Hotel Dec 1st (details here). I’ll be the dude with the DSLR, beard and wearing one of these shirts as well so come up and talk to me. If for some reason you need international shipping I am not guaranteeing that for Xmas delivery, and you’ll need to email me at DCHeavyMetal@Gmail.com so we can figure out what shipping to your country will cost. If you are someone who knows me personally already and I see you at shows a lot, email me first and I can drop the shipping charges if you want to just meet me at a metal show or something. Also, I DO NOT want to trade shirts for one from your band or whatever else. I’m not doing this for profit and trading shirts basically turns this into a loss for me. If you want one buy one, I’m not interested in trading. I’m not planning on printing any extra shirts, just what you people order through December 2nd. If you want one now is the time to get one. If you have any other questions, just email me or ask me in person at one of the above mentioned shows.